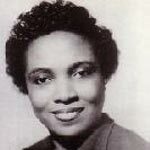 February 12, 1907 Roberta Martin, gospel singer, composer, and choral organizer, was born in Helena, Arkansas, but raised in Chicago, Illinois. In 1933, Martin co-founded the Martin-Frye Quartet. In 1936, the group was renamed the Roberta Martin Singers and they set the standard for gospel choirs, recording such hits as “Only A Look” (1949) and “The Lord Will Make a Way” (1951). Most of their songs and those of many other gospel artists were published by Roberta Martin Studio of Music, a publishing house that she established in 1939. Martin composed about 70 songs, including “Try Jesus, He Satisfies” (1943), “God Is Still on the Throne” (1959), “Let It Be” (1962), and “Just Jesus and Me” (1966). Martin died January 18, 1969 and her funeral in Chicago attracted over 50,000 mourners. In 1998, the United States Postal Service issued a commemorative postage stamp honoring her influence on gospel music.